This salad is a great starter to any spring or summer time meal when strawberries are in season. 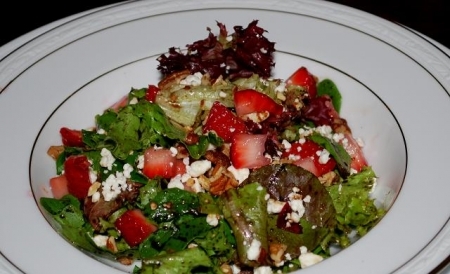 The inspiration for this salad is the balsamic vinegar by Spicewood Food Company – Strawberry Infused Balsamic Vinegar which can be ordered on-line at Spicewood Food Company . Ingredient amounts will serve two. Adjust ingredient amounts to accommodate the number of people serving. Make dressing by slowly whisking olive oil into balsamic vinegar. Set aside. If you have time macerate strawberries with about 1 tablespoon of the wine you will be drinking. This is optional, but does make them taste great. Toast nuts in a small non-stick skillet over medium high heat for about 2 minutes. Stir often so they do not burn. Place greens in a large bowl and toss with about 3 tablespoons of the dressing until evenly coated. Add tossed greens to a salad bowl and top with strawberries, feta cheese and pecans. For lunch, try an ice tea or for dinner try Woodrose Winery Texas Rain (Texas), which is a semi dry rosé that has hints of strawberry flavors and is a perfect match. Or try Texas Hills Vineyard Rosato di Sangiovese (Texas) or Peju Rosé of Syrah (Napa Valley). If you can’t find the Texas wines suggested, they can be ordered on line at www.woodrosewinery.com and www.texashillsvineyard.com. You should be able to find Peju in most stores or order online at www.peju.com.